I know a lot of people have a special place in their hearts for Planescape but for me it is Spelljammer. I would probably be inclined to make everything a planet floating within the Astral sea and then cover up the inconsistencies with Portals. So the Faewyld is one (or more) planets out there as is the Shadowfell as are the 9 hells(9 hell planets? ), Mt Celestia and whatever else. "Planet" is something of a vague term here as in 4e the planets of the Astral Sea seemed to work more like Color pools than anything else. In order to keep the uniqueness of Sigil, I would call that the Center of the Universe. It sits in the middle of the Astral plane on top of the massive spire and everything else more or less orbits around it. 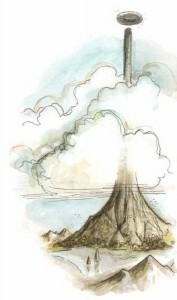 Finally, for the conglomeration that is the Elemental Planes/Limbo/The Elemental Chaos/The Far Realm/The Abyss/etc, I'd probably put that at the bottom of the spire and have that serve as where things get tossed when the rest of the universe doesn't want to deal with it. I'm a big fan of Spelljammer too - we had a lot of fun playing games in that setting. I basically agree with this - I like it. Funnily enough, with the art especially in PS showing adventurers leaping bodily from one "plane" to another (huh? ), I think the "motes floating in an astral sea" actually fits Planescape far better than the original setup of separate planes does. The floating realms can be arbitrarily big, after all - we have an infinity of space to play with! Oceanus and Styx can wend through several "lands" before they disgorge into the Astral Sea (or even flow through it, keeping a distinct identity in some mysterious way). 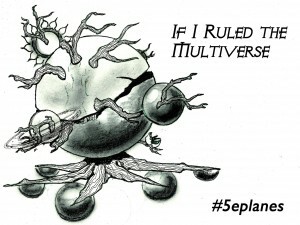 As for the Nine Hells (and other layered realms) - how about a multi-layered planet, with several shells, a bit like a "Russian Doll"?